Roland CUBE amplifiers are ideal for low-volume practice sessions, and for use in street performances, where electricity may be unavailable. Musicians or audio technicians may want to disassemble a Roland Micro CUBE-30 amplifier to replace a speaker change the speaker's appearance. Whatever the reason, this tutorial will demonstrate how to safely take apart a Roland CUBE-30 amplifier. Unscrew the four black screws attached to the silver faceplate using the #2 Philips screwdriver, and remove the faceplate from the speaker cabinet. Unscrew the four black screws attached to the speaker. Carefully remove the speaker from the cabinet, and detach the spade connectors attached to the rear side of the speaker. Unscrew the 24 black screws that connect the plastic edge and corner pieces to the speaker cabinet chassis. Remove each plastic edge and corner piece individually. Unscrew the seven large black screws that connect the rear panel of the amplifier to the amplifier cabinet. Unscrew the three large black screws that connect the top control panel of the amplifier to the amplifier cabinet. Insert the flathead screwdriver into the top- and bottom-left joints of the speaker cabinet and pry the joints loose. This will allow you to remove one side of the speaker cabinet. Remove the rear panel from the speaker cabinet and the top control panel from the speaker cabinet. 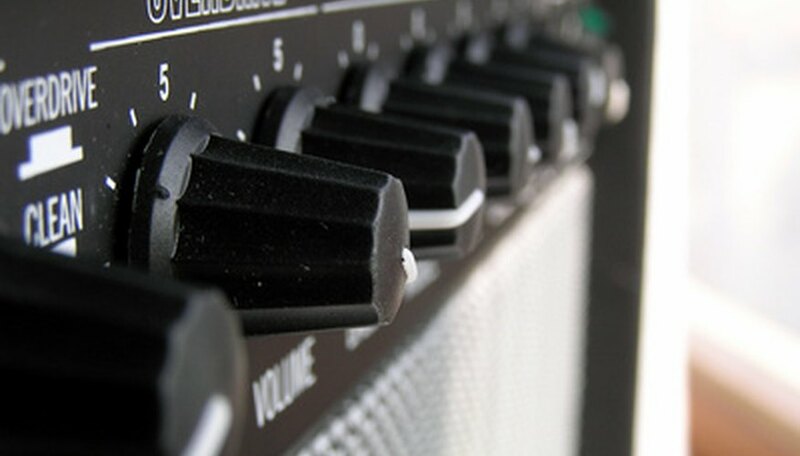 Be sure to disconnect the amplifier from all sources of electricity before beginning any alterations, modifications or repairs. Bobby Raleigh began his career in independent publishing in 2004, covering business, marketing, entrepreneurship, digital media, and blues music, amongst other topics. Since 2010, Mr. Raleigh has edited The Slide Shack, a social network connecting slide musicians directly with fans. Raleigh has a Bachelor of Arts in English from Portland State University.